Officially, Wooster Beach has been officially considered the initiator of the new philosophy of Reformed Medicine. The practice of Reformed Medicine, which would later take on the name of Eclectic Medicine officially during the late 1820s and early 1830s, began with just a few simple claims that distinguished it greatly from the field of regular medicine. The primary feature of Reformed Medical practice was the refusal to use the lancet for blood-letting. Other beliefs which were added to this core principle were the limited use or even refusal to use opium and its derivatives, and the mineral remedies and some of the very strong plant derivatives considered to be overly toxic such as purified Conium preparations (hemlock). Otherwise, Reformed Medicine allowed for physicians to make their own choices as to which medicines to use and how, based upon any mixture of applications they wished to follow, including Thomsonianism, Indian Root Doctoring and even allopathy and perhaps homeopathy, once the knowledge of each of these came into being. The first school to try to open following the initial schools reviewed above was a medical school in Columbus, Ohio. The founder of this school had just moved out of the the lower New York region into Ohio, where he and two others tried to begin this school. There is little known exactly about this school, its classes or textbooks, or even the type of healing practices to be included in this training. The only possible additions to medicine at this time might have pertained to certain medical electricity practices, although 1817 represents a lull in the history of this part of the medical profession. Chances are the new teachings at this school would have focused on climate, meteorology, topography and health, and included extensive knowledge sharing about the potential uses of local plant medicines as drugs. 1817. OH. REGULAR/REFORMED? (Medical College), Columbus, OHIO. Van Kleeck initiated. Short-lived? REGULAR/REFORMED? 1818. KY. REGULAR. Transylvania Medical School officially opened. University formed 1780. Possible medical researchers active in the late 1790s (animalculists). But the Official opening was 1818. 1820. ME. REGULAR. Medical School of Maine, Bowdoin College, Brunswick, MAINE. Org. 1820, 1st class 1821. REGULAR. 1821. OH. REGULAR. Medical College of Ohio, Cincinatti, OHIO. Org. 1819, 1st class 1821. REGULAR. 1821. DC. REGULAR. National Medical College, Medical Department, Columbia University. Washington, DC. Org. 1821, 1st class 1822. REGULAR. 1823. VT. REGULAR. Medical Department, Burlington, VERMONT. Org. 1822, 1st class 1823. REGULAR. 1824. MA. REGULAR. Berkshire Medical College, Pittsfield, MASSACHUSETTS. Org. 1824. REGULAR. 1824. SC. REGULAR. Medical College of South Carolina, Charleston, SOUTH CAROLINA. Org. 1824–1839. REGULAR. 1824/5. NY. REFORMED/ECLECTIC. School of Reformed Medicine, New York City, New York. Org. 1824/5. Dissolved due to a mob scene in 1825/6. REFORMED/ECLECTIC. 1825. VA. REGULAR. Univ. Virginia Medical Department, Charlottseville, VIRGINIA. Org. 1825, 1st class 1828. REGULAR. 1826. VA. REGULAR. Medical School Valley of Virginia, Winchester, VIRGINIA. Org. 1826. REGULAR. 1827. VT. REGULAR. Vermont Medical College, Woodstock, VERMONT. Org. 1827. REGULAR. In the following map, the Spheres of Influence taken from the above map are displayed as circles, a method pretty much akin to interpreting these circles as buffers. The old schools appear as circles, the new schools as points (stars) with information placed adjacent to each point. Perfectly overlapping circles are slightly different in size. There is a tendency for schools to open in new places placed just outside to regions that are influenced. Some fill in the gaps between two well-spaced regions. The central group formed involving Transylvania, Columbus and Cincinnatti is a new site developed from which any cultural diffusion related to these schools is expected to continue in the years ahead. There is also the possibility that Charleston is going to be a place from where progress is made in generall economically and where new medical schools will later be required. We also see a ntendency for the schools to be aggregating around the mid-Atlantic to Boston region, an early sign of the megalopolis this region would later develop into. There is one alternative medical school illustrated on this map. It is the New York City School of Reformed Medicine initiated by Wooster Beach. This school would only last a year due to a mob that gathered and attacked the school in 1825. 1830. NY. REGULAR. Auburn, NEW YORK. REGULAR. 1830. NY. REGULAR. Geneva, NEW YORK. REGULAR. 1826. PA. REGULAR. Jefferson Medical College, Philadelphia, PENNSYLVANIA. Org. 1826, 1st class 1827. REGULAR. 1829. GA. REGULAR. Medical College of Georgia, Augusta, GEORGIA. Org. 1829. REGULAR. 1831. NY. REGULAR. NY School of Medicine, NYC, NEW YORK. Org. 1831. REGULAR. 1833. IN. REGULAR. University of Indiana, New Albany, INDIANA. Org. 1833. Extinct by time of R.L Polk’s writings. REGULAR. 1833. SC. REGULAR. Medical College of the State of South Carolina, Charleston, SOUTH CAROLINA. Org. 1833. REGULAR. 1834. OH. REGULAR? Worthington Medical College, Cincinatti, OHIO. Org. 1834. REGULAR? 1834. OH. REGULAR. Cinncinatti Medical College, Cincinatti, OHIO. Org. 1834. REGULAR. 1834. LA. REGULAR. Tulane University, Medical Department, New Orleans, LOUISIANA. Org. 1834. REGULAR. 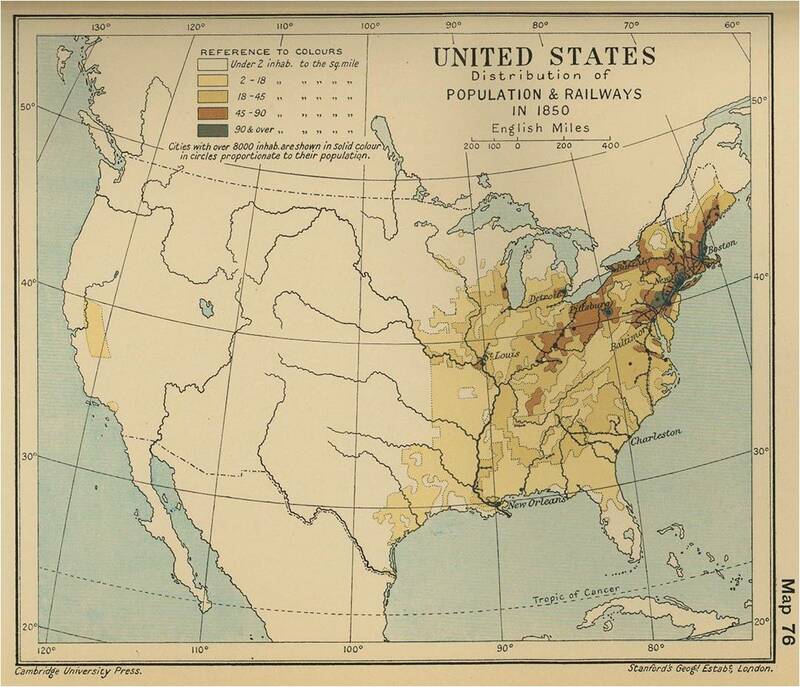 Each of these maps provides us with different insights into the medical diffusion process. 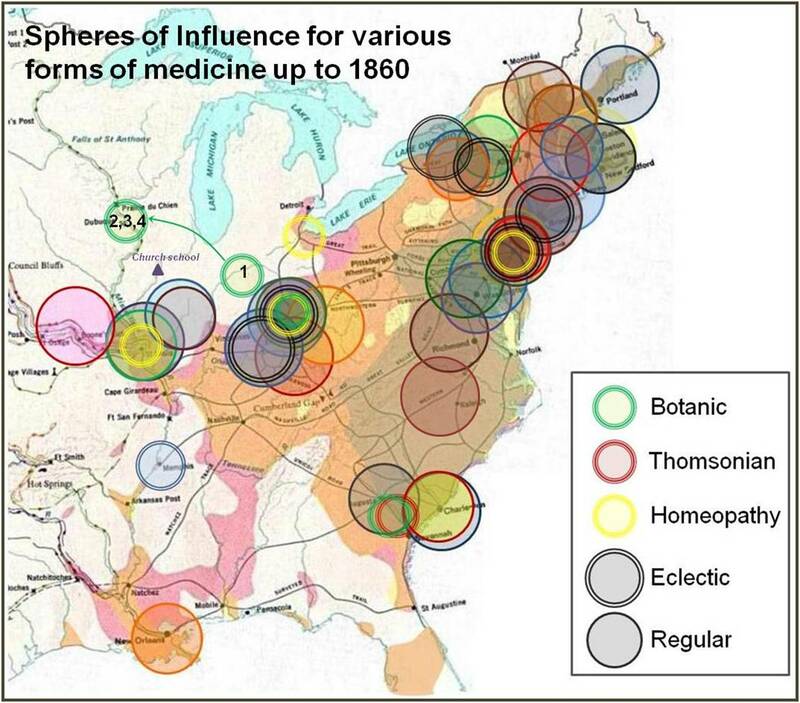 These maps are focused on regular medicine not alternative medicine such as Eclectics and Homeopathy. 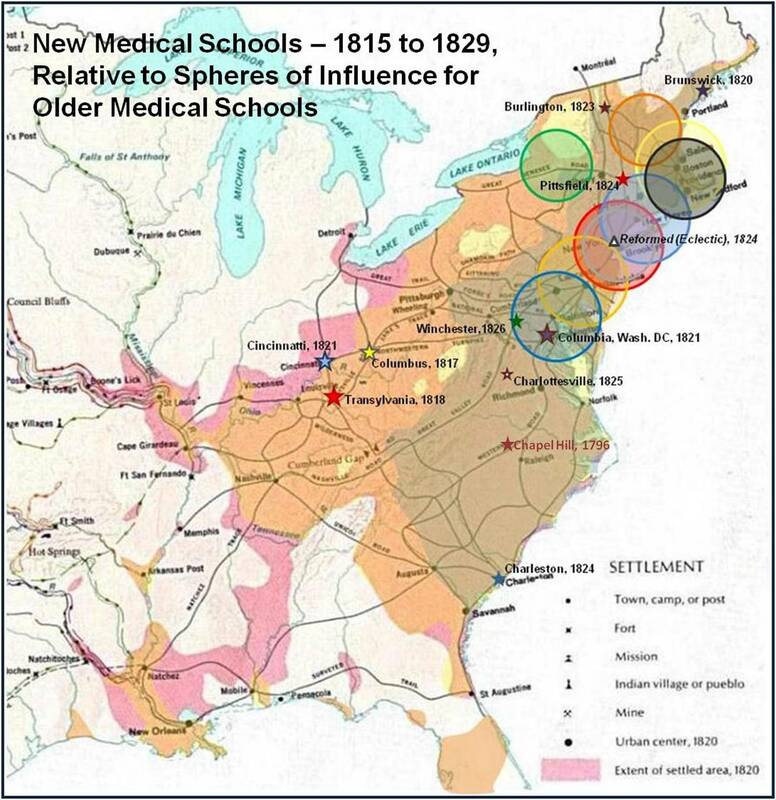 These schools are covered in the next section, 1835-1850, the period when more alternative schools were opened for the first time than newly established regular medical schools. The Sudden and Rapid Growth of Non-Allopathic Medical Schools began some time around 1835. 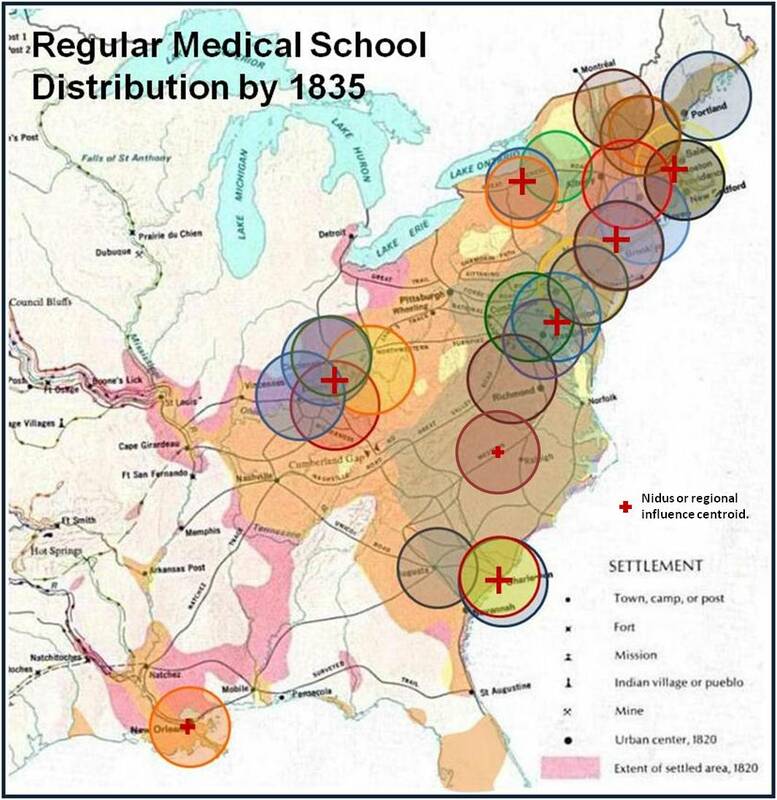 From 1837 to 1849, only a thirteen year period, 14 non-allopathic medical schools opened and 7 regular medical schools. Another possible regular school also tried to open during this time, but due to political differences and political moves and actions taken converting this school from allopathy, to some sort of reformed medical school and from there back to regular medicine, this school ultimately had to close just ten years later. One of the non-allopathic schools opened in Indiana, but held jsut one session and then remvoed to Illinois, where it underwent another move or two before settling in Iowa, where two moves later it was finally acquired by a school, possibly allopathic in its teachings. Between 1837 and 1849, four homeopathic, seven eclectic, and three botanic schools were opened. In 1850, one homeopathic, one eclectic, one Thomsonian and one possibly multifaceted school were opened. Between 1851 and 1859, six schools opened–three homeopathic and three eclectic. Allopathy was losing the political battle when it came to establishing a new for of medical education and medical philosophy. In terms of national associations, homeopaths were the first to win in this part of the political battle, forming their national association in 1848. The national homeopathic group was followed by the American regular medical group, the name for which wasn’t American Medical Assocation (), formed in 1850. In 1852, the National Eclectic Medical Assocaition was formed. A number of important legal events were taking place during this period of time as well. Several states were demonstrating a tendency to support the non-allopaths more than the allopaths. A couple of states had laws written to make the non-allopathic practices illegal, only to be reversed fairly quickly. 1837. PA. HOMEOPATHY. Unnamed. Mid to Western Pennsylvania. HOMEOPATHY. 1839. OH. ECLECTIC. American Medical College, Cincinatti, OHIO. Org. 1839. ECLECTIC. 1839. PA. REGULAR. Pennsylvania Medical College, Philadelphia, PENNSYLVANIA. Org. 1839. Extinct by time of Polk’s writings. REGULAR. 1839. OH. ECLECTIC. American Medical College (Eclectic), Cincinatti, OHIO. Org. 1839. ECLECTIC. 1840. MO. REGULAR. Missouri Medical College, St. Louis, MISSOURI. Org. 1840, 1st class ca. 1845(?). REGULAR. 1840. OH. BOTANICAL. Botanico-medical College of Cinncinati, OHIO. Org. 1840. In 1850 the name was changed to Physio[Physo]-medical College. Six months later this school merged with Cincinnatti Medical College? BOTANIC. 1841. MO. REGULAR. St. Louis Medical College, St. Louis, MISSOURI. Org. 1841. REGULAR. 1843. IL. REGULAR. Rush Medical College, Jacksonville, ILLINOIS. Org. 1842, 1st class 1843. REGULAR. 1843. IL. REGULAR. Medical Department, Illinois College, Jacksonville. ILLINOIS 1843. REGULAR. 1845. OH. ECLECTIC. Eclectic Medical Institute, Cincinatti, OHIO. Org 1845, 1st class 1845. ECLECTIC. 1845. MA. REGULAR. Worcester Medical College, Worcester, MASSACHUSETTS. Org. 1845–1859. ECLECTIC. 1845. MO. REGULAR. University State of Missouri Medical School, Columbia, MISSOURI. Org. 1845, 1st class 1846. REGULAR. 1846?. KY. ECLECTIC. Eclectic Medical College, Louisville, KENTUCKY. From ? — to ca. 1848. ECLECTIC. 1848. KY. ECLECTIC. King Eclectic Medical College, Louisville, KENTUCKY. Org. 1848, extinct by printing of Polk’s Dir. ECLECTIC. 1846. TN. REGULAR/BOTANIC? Botanic-medical College, Memphis, TENNESSEE. Org. 1846–1860. Mixed history, between Regular and Botanic. Michael Gabbert, author of a history of Reformed Medicne in the Southern United States, suggests political problems had commenced around 1850. Articles published in 1850 in the Physiomedical Recorder (editor Alva Curtis, Illinois) confirm this. BOTANIC. 1848. PA. HOMEOPATHIC. Hahnemann Medical College, Philadelphia, PENNSYLVANIA. Org. 1848, 1st class 1849. HOMEOPATHIC. 1848. IN. BOTANIC? (Indiana Medical College). 1848. One session in INDIANA. Removed to Rock Island, IL. BOTANIC? 1848. NY. ECLECTIC. Rochester Eclectic Medical College, Rochester, NEW YORK. Org. 1848–1852. ECLECTIC. 1848. PA. HOMEOPATHIC. Homeopathic Medical College of Philadelphia, Philadelphia, PENNSYLVANIA. Org. 1848. HOMEOPATHIC. 1849. IL. BOTANIC?. (Medical College). 1849. One Session. Rock Island, ILLINOIS. Removed to Davenport, IA. BOTANIC? 1849. OH. HOMEOPATHIC. Homeopathic Hospital College, Cleveland, OHIO. Org. 1849. HOMEOPATHIC. 1850. GA. THOMSONIAN. ‘Thompsonian’ College, Barbourville, GEORGIA. Org. 1850, Extinct. THOMSONIAN. 1850. NY. ECLECTIC. Syracuse Medical College, Syracuse, NEW YORK. Org. 1850–1857. ECLECTIC. 1850. KY. REGULAR. Transylvania University, Medical Department, Lexington, KENTUCKY. Org. 1817, 1st class 1850/9. REGULAR. 1850. IA. BOTANIC?/REGULAR? (Medical College). 1849. One Session. Davenport, IOWA. Removed to Des Moines and then purchased or merged with Keokuk, IA; BOTANIC?, merged with REGULAR in Keokuk? 1851. IL. HOMEOPATHIC. Hahnemann Medical College, Altosp., Chicago, ILLINOIS. Org. 1851, 1st class 1860. HOMEOPATHIC. 1852. NY. ECLECTIC. Metropolitan Medical College, NYC, NEW YORK. Org. 1852–1862. ECLECTIC. 1856. OH. ECLECTIC. Eclectic College of Medicine and Surgery, Cincinatti, OHIO. Org. 1856, 1st class 1857. ECLECTIC. 1859. MO. HOMEOPATHIC. Homeopathic Medical College of Missouri, St. Louis Missouri, St. Louis, MISSOURI. Org. 1859. HOMEOPATHIC. (1859). MO. HOMEOPATHIC. 4 others in St. Louis, MISSOURI. HOMEOPATHIC. 1859. PA. ECLECTIC. American Eclectic Medicine College, Philadelphia, PENNSYLVANIA. Org 1859–1880. ECLECTIC. Based on the above maps and the items discussed on the previous page, there are two fairly well defined regions we can identify based on medical school distribution. There are the regions covered well by the spheres of influence for the schools, and other regions not at all within the spheres of influence. These latter settings would have some impacts produced if physicians from medical schools practice locally, but based on the reduced likelihood that an individual who resides far away from the school is likely to attend a school as distance is increased, we expect these hinterlands to demonstrate much more sociocultural impact than economic-trade related medical impacts. This means that the family history in terms of ethnicity, religion and country of origin is going to have a much greater likelihood of playing a role in a given region’s medical practices and beliefs. The control of the medical field by regular medicine only exists where its spheres of influence are greater than the same for irregular medicine, and the impacts of sociocultural beliefs and expectations do not cause the local social scene to discredit any regular medical teachings. During periods of epidemics, people question the skills and credibility of regular medical physicians. This leads to the formation of new faiths, new schools, new ideologies and even new regional or governmental laws designed to support the irregular practices. The yellow fever epidemic accomplished this in the very early 1800s, and Asiatic cholera in the very early 1830s, and around 1850. 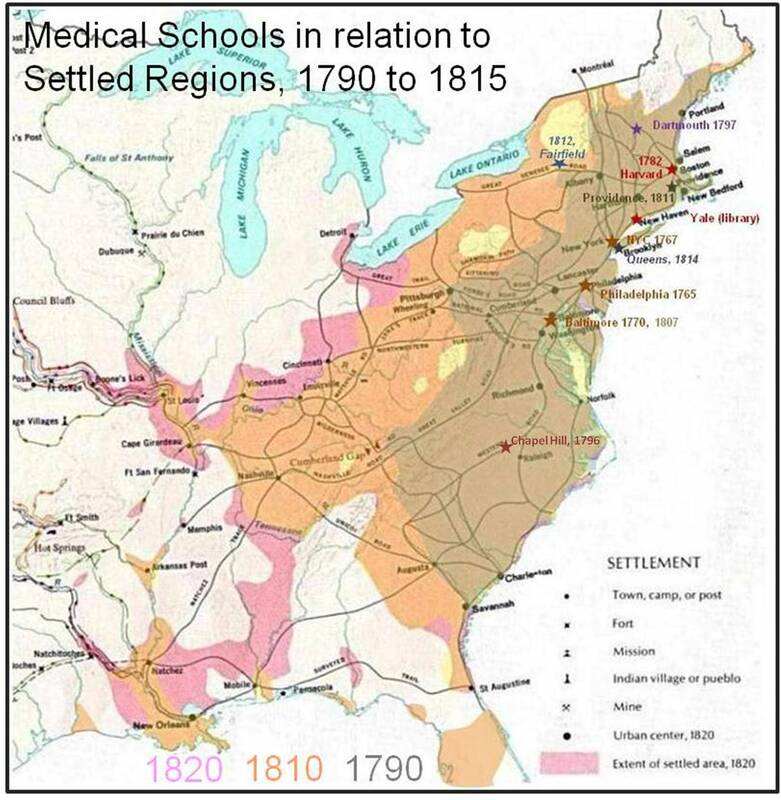 The majority of schools formed during this period in American medical school history are irregular medical schools, not regular medical schools. This success rate has multiple reasons for its existence, at professional, legal, societal and philosophical levels. Non-allopathic medical schools were very popular by 1850 due to their success rate, their compliance with religious beliefs, events which the public perceived as a lack of failure in providing effective medical treatment, the tendency for allopaths to ignore public opinion (i.e. no more “poisons” or lancets), and the general overall sense of complacency regular physicians seemed to have regarding public concerns, moral beliefs, or the request for a much healther way of living and being cared for. Born as a result of common sense, propagated by Jacksonianism, this growth of irregular medicine in this country was at its peak by the time the first national medical associations were born–which for homeopaths was in 1848, allopaths-1850 and eclectics-1852.